James Comey said he doesn't know with certainty whether President Trump "was with prostitutes peeing on each other in Moscow in 2013," in an interview with ABC News that will air in full on Sunday. In his new book, Comey recalls a conversation he says he had with Mr. Trump, in which the president asked Comey to look into claims that a so-called "pee tape" existed from 2013 showing him with hookers peeing on each other, one of the more salacious allegations in the unverified dossier authored by former British spy Christopher Steele. Mr. Trump, according to Comey, wanted Comey to clear up the allegations because he said his wife, Melania Trump, was upset by them. He asked Comey to investigate what Trump called the "golden showers thing." Comey's new book, "A Higher Loyalty," detailing his time as FBI director, will be officially released Tuesday, but multiple news outlets, including CBS News, have obtained copies of the book. Comey on a possible Trump "pee tape"
"I honestly never thought these words would come out of my mouth, but I don't know whether the current president of the United States was with prostitutes peeing on each other in Moscow in 2013," Comey told ABC News' George Stephanopoulos. "It's possible, but I don't know." As of his firing, the information on such a recording was still "unverified," Comey said. According to the Associated Press, which also obtained the book, Comey said that when he briefed Mr. Trump on the Steele dossier, he left out one detail – the one involving the allegation that the prostitutes had urinated on a bed once used by the Obamas. The president raised the subject again a week later, after the dossier had been made public, according to the book. 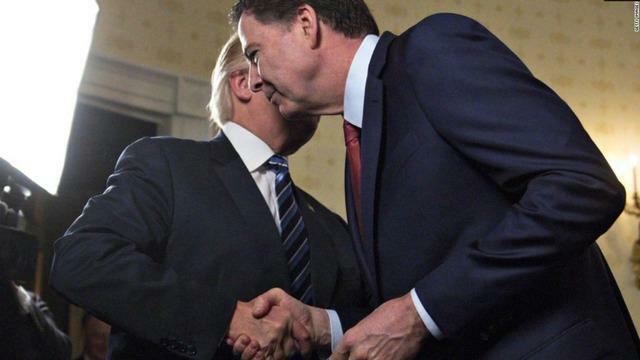 Comey wrote in his book Mr. Trump told Comey at that time, that he had not stayed in the hotel and also that the charge could not have been true because, as Mr. Trump said, "I'm a germaphobe. There's no way I would let people pee on each other around me. No way." "He [Trump]brought up what he called the 'golden showers thing' … adding that it bothered him if there was 'even a one percent chance' his wife, Melania, thought it was true," Comey recalled. Comey suggests the phrase "golden showers thing" was the phrasing Trump used during that conversation. "He just rolled on, unprompted, explaining why it couldn't possibly be true, ending by saying he was thinking of asking me to investigate the allegation to prove it was a lie," Comey wrote. "I said it was up to him." Mr. Trump took to Twitter Friday morning in his first public response to the book, calling Comey a "slime ball" and saying he "should be prosecuted." "His handling of the Crooked Hillary Clinton case, and the events surrounding it, will go down as one of the worst 'botch jobs' of history," the president tweeted. "It was my great honor to fire James Comey!" James Comey's new book, "A Higher Loyalty," is to be released next week. Amazon shows the book's release date as Tuesday, April 17th.